Adam Smith is considered the father of Economics, more particularly modern Economics. People across geographies have grown with this belief that it was he who through his academic treaty called An Inquiry into the Nature and Causes of the Wealth of Nations in 1776 (the year when Declaration of Independence was adopted) introduced the world with the importance and management of resources of a nation. He was a professor of morality at the University of Scotland and he argued and caught the academic attention through this work, much after his first book The Theory of Moral Sentiments (1759) which was received by its readers as a remarkable contribution for the study on selfishness, conduct, and duties of humans. He systematically elaborated the resources of a state and its proper management for the welfare of citizens. This modern treaty paved way to the policy makers and people interested in the management of resources. However Kautilya's Arthashastra which was written some 2400 years back still remains first work on bringing out resources for nation/kingdoms. Though it has never been taught to us but lot of times a reference is made to this great work written sometime around 320 BC, while Chanakya was advising Chandragupta for better governance of state. Having been exposed to Adam Smith's economics, I always had this desire of reading Kautilya's Arthashastra and in this process came across this initiative of Gurcharan Das in tracing the history of Indian business. 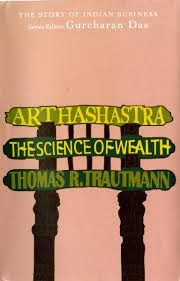 This book entitled 'Arthashastra - the science of wealth' by Thomas R Trautman, Professor emeritus of history and anthropology at University of Michigan, is a concise commentary on Kautilya's Arthashastra. Different versions and narrations have been studied by the author and he conveys the essence of that voluminous work through this brief, yet focused account of economics through chapters on Kingdoms, Goods, Workplaces and Markets. In the modern day context, when we do not have Kingdoms, they could be studied, related and compared with the functions of a state, government and administrators. Though last 2500 years have witnessed remarkable transformation in technology, transportation, communication, education, trade practices and control etc, yet one can observe much of the same behaviour, much of the same market operations and trading treaties. Business strategies of modern times are all crafted with the same mindset as they would have been crafted centuries before though nature of goods and services have changed drastically. This is where study of history becomes important which at times leads us to reiterate a point that come what may, human instincts remain same, they carry with similar value systems as good and bad are still same. Workplace behaviour is more or less same though the ambiance and approach has changed. The foreword of the book is authored by Gurcharan Das which creates a platform for the book and introduces the theme of the book. I enjoyed this book thoroughly in a series of books published by the London School of Economics tracing back the Story of Indian Business and having gone through the other title 'The East India Company - the world's most powerful corporation' by Tirthankar Roy. As a student of modern day economics and human/organizational behaviour, I could find a close link between Kautilya's Arthashastra and Adam Smith's thinking (on human behaviour, organizations and economics). Indian academia has suffered a lot due to poor documentation and numerous invading interests which have somehow spoiled the age old academic treasures. In this light this volume is a gift to the students of economic history and for this the whole initiative of this kind deserve applause. I suggest this book for all of those who are interested in the study of history of political economy in India, and the history of business and economics of this part of the globe.